Home Politicians Justin Trudeau Wife, Father, Mother, Family, Height, Is He Gay? Canada’s Prime Minister, Justin Trudeau will go down in history as one of the youngest leaders to be at the helm of affairs of one of the most powerful countries in the world. He is also the second youngest leader his country has ever produced and a look at his background will obviously answer the question of how he was able to rise to be where he is now. Here, we are going to look at all of that including what the talk is about him being gay. So, if you are as curious as we were, satiate yourself with the facts about the young leader below. Justin Trudeau is addressed in full as Prime Minister Justin Pierre James Trudeau. He is a Canadian politician and the 23rd Prime Minister of Canada (beginning in 2015). The young leader was born on Christmas day (25th December) in the year 1971 into a Canadian family in Ottawa Civic Hospital, Ottawa, Ontario, Canada to the late former Canadian Prime Minister (15th) Pierre Elliott Trudeau and his now ex-wife Margaret Trudeau. He had as his younger siblings Alexandre (Sacha), and late Michel Trudeau who all made history as the third and fourth kids to be born to a serving Canadian leader. Growing up, the Prime Minister was in 1976 enrolled at Rockcliffe Park Public School and later spent a year at Lycée Claudel d’Ottawa. After high school, he enrolled at Collège Jean-de-Brébeuf before bagging a literature degree from McGill University and later a bachelor in education from the University of British Columbia. After college, he started off his career as a French and Maths teacher in West Point Grey Academy before venturing into politics. The potential prime minister won his first political seat as Member of the Canadian Parliament for Papineau in 2008. He built his way up as he grew in the Canadian Liberal Party showing himself to be good both in the internal politics of the party and someone the wider Canadian populace will trust with the leadership of their country in the future. Trudeau would then begin working his way up the leadership of the Liberal Party in 2012 and subsequently emerged the party’s leader in 2012. He led them to victory in the October 2015 federal elections in Canada and by November of the same year, he was sworn in as the 23rd Prime Minister of Canada. He has held the position since then making significant reforms in the Senate, electoral act, women right, migration and in many other areas including marijuana which has recently been legalized for recreational use in the country. Prime Minister Justin Trudeau was born to the 15th Prime Minister of Canada, Pierre Trudeau (born October 18, 1919 – died September 28, 2000) and his wife Margaret Sinclair. Despite being born into a family that could give him all the comfort he desired, Justin’s parent made his childhood as normal as possible. For the most part of his childhood, he attended a public high school and went to school with the school bus. He spent his summers in Algonquin Provincial Park where he also later got his first paid job as a camp counselor. Nevertheless, 6 years after he was born, his parents got separated with his father initially having custody over him. Following his father’s retirement from office in 1984, both his dad and mom had joint custody over him till he grew up to be able to fend for himself. Who is His Wife or is He Gay? 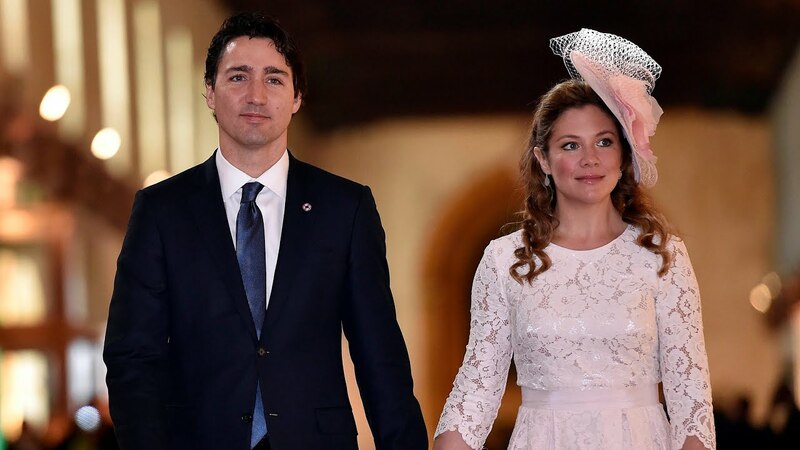 Trudeau is married to Sophie Grégoire who she first met when they were both kids growing up and schooling in Montreal, Canada. Following years of separation in their young adult lives, the two lovebirds met in 2003 when the belle was assigned to host Trudeau’s charity ball. The infant love between them came back to life as the duo began dating leading up to their engagement in October 2004 and subsequent marriage on May 28, 2005. The ceremony was held in Montreal’s Sainte-Madeleine d’Outremont Church. Their union has since then seen to the birth of three lovely children viz Xavier James (born October 18, 2007), Ella-Grace Margaret (born February 5, 2009) and Hadrien Grégoire (born February 28, 2014). Perhaps, another Canadian Prime Minister will emerge from one of them. In tandem with what is happening in most occidental countries in our world today, Justin Trudeau has not being left in the gay rights movement. Being a world leader, his stance on the perception and treatment of gays have a far-reaching effect in every facet of a gay person’s life at least in Canada. The Canadian leader himself is not gay as we know that he is married to a woman. However, he did what most world leaders will shroud at doing. The young leader made history to be the first Canadian Prime Minister to join a Gay Pride parade that held in Toronto in 2016, he also participated in the inaugural Canada Pride 2017 event in Montreal where he marched alongside famous Ireland’s first openly gay Prime Minister Leo Varadkar. The Prime Minister also made a historic apology to individuals who were adversely affected by the Canadian “gay purge” discrimination against gay Canadians. He disclosed that the Canadian government will pay up to 110 million Canadian dollars or 85 million US dollars to victims of the purge. It is worthy to note that Justin Trudeau is welcoming of gay people and it was for this reason that in January 2017, he was on the cover of Attitude magazine – the UK best selling and award-winning gay magazine. Justin Trudeau stands at a height of 1.88 m or the equivalent of 6 feet 2 inches. He grew taller than his father who stood at 1.78 m or 5 feet 8 inches.